When it comes to adding to the basic features of a car, the Model T Ford accessories list became immense. With accessories for improved appearance, improved braking such as the Rocky Mountain brakes, Model T Ford auxilliary transmissions such as Warford, or modern day ignition kits such as the Truefire owners were and still are spoilt for choice. If you have any pictures of period accessories, we'd love to see them, let us know using the contact us page. 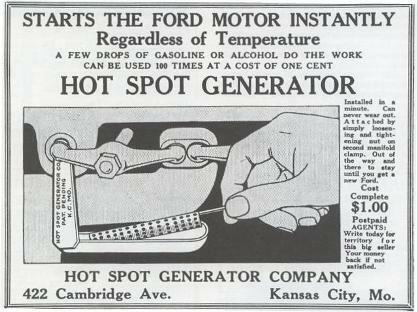 Here's a few Model T Ford period accessory ads I found. The Ever-Ready oiler comprises of an oil reserve tank that mounts on the engine against the exhaust manifold. The tank holds the oil reserve and an actuating solenoid. 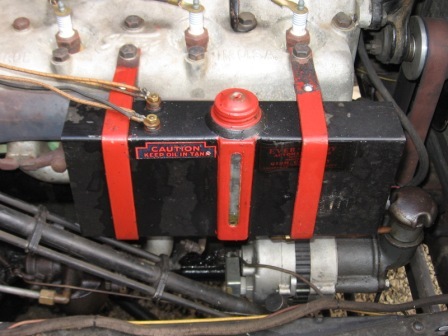 A filling indication light that clamps onto the dasboard and a replacement transmission inspection cover and switch assembly, filler feed pipe and filler cap extension. The operation works as follows: The switch assembly is fixed to the underside of the transmission cover plate and collects oil splash whilst the engine is running. When the engine has sufficient oil, the amount of oil splashed up into the switch collection dish is sufficient to overcome the spring tension and keep the switch disconnected. Once the oil level drops, the collection dish holds less splashed oil, rises up and makes an electrical connection. The power to operate the system comes from the magneto post, the power running through the switch to the terminals on the reserve tank. When the solenoid opens, the oil is allowed to flow through the filling pipe, into the engine filler via an extension tube that the pipe enters, allowing the engine filler cap to remain on. At the same time, the dashboard light, also connected to the tank terminals, illuminates. 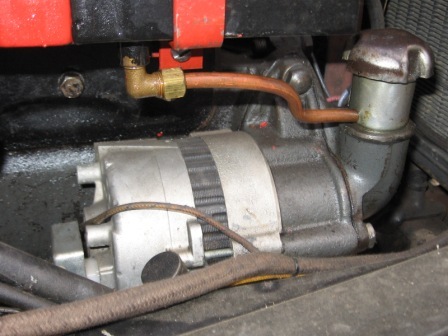 Once sufficient oil has been released into the engine, the switch collection dish is weighted down enough to disconnect the switch and the tank solenoid closes, stopping the oil flow. 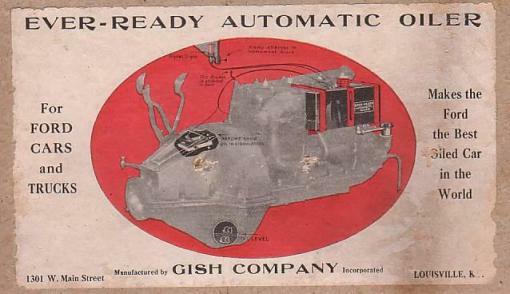 These are images of the Gish Oiler box. When considering auxilliary transmissions, these are largely grouped into where they are located when installed and whether they supplement of replace the original Model T Ford unit. Loosely, they are classified as either front or rear mounted. Front mounted units are typically installed directly behind the standard engine transmission unit and before the driveshaft, with rear mounted units fitted between the end of the driveshaft and the front of the differential housing. Let's look in a bit more detail at those that are considered the more desirable units, Jumbo, Muncie and Warford. In 1923 the Price-Hollister company in Illinois began building the Jumbo transmission. Like the Muncie, this was a selective sliding gear transmission and in conjunction with the Model T Ford transmission, also produced 7 forward speeds and five reverse. 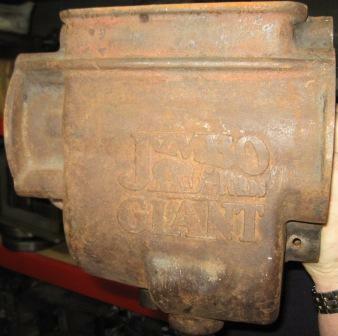 Transmissions were provided for both the car and truck market, but in 1924, the company began producing the Jumbo Giant. This was basically a "beefed" up version of the Jumbo transmission, specifically built for the truck owner. Warford The Warford transmission, also a selective sliding gear unit, was originally produced as the Conord transmission, a rear mounted unit in 1917. At this time, the Ford owner could purchase the unit with either an underdrive or overdrive and with 3 forward gear ratios, which combined with the Ford unit, provided 6 forward ratios and 3 reverse. The Partridge, Singer and Baldwin company bought the rights to the transmission on 1921 and later that year began marketing the transmission as a front mounted unit called the Warford. This continued on until 1923 when the company changed its name to the Warford Corporation. The Warford name was cast into the side of the casing like many brands of the day and is easily identifiable. 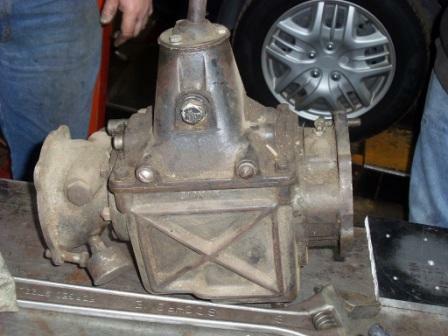 One factor that raises the popularity of the Warford transmission is that a modern, improved version of the transmission is available for sale today! 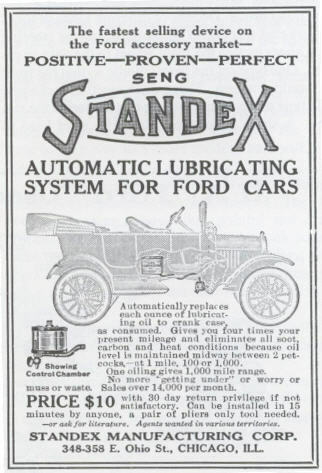 Perhaps the greatest downfall for Model T Ford enthusiasts is that the majority of all of these sliding gear transmissions had no synchronising of gears, and are commonly known as crash boxes, the crash being the clashing of gear teeth if the operator didn't get change made cleanly. This over the years resulted in the wear and damage of the gear teeth and can result in "jumping out of gear". The only options available if you locate a damaged box are to locate some decent second hand gears, or, have new gears made (quite expensive). What seems to be a popular emerging trend is to change from the Ruckstell 2 speed axle to the new KC Warford transmission which provides the nostalgia of a period accessory but brand new! This link takes you to Texas T Parts who are a distributor of the new Warford. You'll find free downloadable data sheets and pricing here. In general, the rear mounted transmissions were basically the same concepts as the front mounted units, although their location required long shifting rods bringing the controls back to the vehicle driving position. A perceived downfall was that, being at rear of the vehicle and directly in front of the differential, the transmission and therefore its weight, had to move up and down with the rear axle, rather than being fixed directly to the engine/transmission pan with bracing to the chassis. One that differed from the pack was the Jumbo Planator. Offered late in the Model T life, the Planator was introduced in 1926. 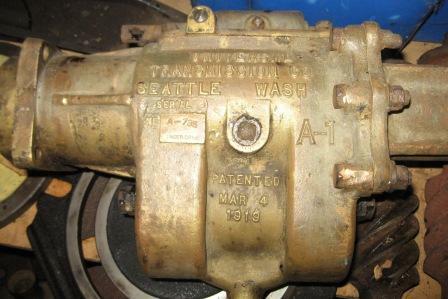 Price-Hollister offered the Planator as a rear mounted, two speed planetary gear transmission. This provided two forward gears and therefore in conjunction with the standard transmission, 4 forward and 2 reverse gears. Advertising of the day pushed the fact that it was a planetary transmission, and one can only assume, gain credibility of this choice from the reliability of the Ford planetary transmission, that 80% of the gears were standard Ford parts (so presumably cheap and easy to obtain). It was comparatively cheap to the sliding gear transmissions at $49-50, was easy to install and easy to operate. We're looking to expand our library of Model T related photo's. If you've unearthed that treasured gem of a Model T Ford period accessory, why not share it with everyone. We'd love to see what is out there! Have you unearthed a great Model T period accessory? Have you found a period accessory from the Model T? 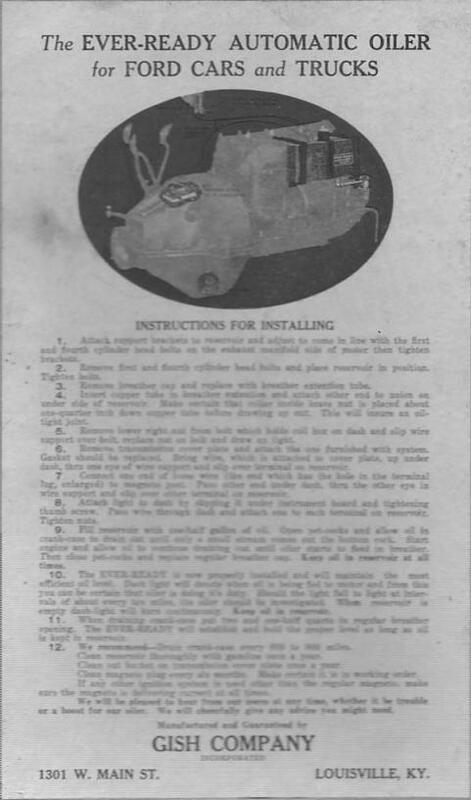 Catalogues show that there were hundreds available in the Model T's heyday. Share your discovery with everyone else here. Come back here soon, or subscribe to the site blog (use the orange RSS feed button on the left)as I'll be featuring some photo's of a few different transmissions including some of the common wear problems shortly. I will be featuring various popular products, as well as new one's to the market on this page as they become available. My experience with the True-Fire system. Read about the Z head here. Read about the transmission oil screen here.